If a person can be judged by his enemies, Steven Pinker should be very proud. Few thinkers arouse such fierce and united opposition from religious reactionaries, anti-science nuts, authoritarians, collectivists, cynics, pessimists, "bio-ethicists", and in general the pushers of everything dreary and hostile to freedom and progress. It's not hard to see why. He not only refutes their nonsense, he's got mountains of hard data to back up his case. Part of the book continues the theme of his earlier work The Better Angels of Our Nature, showing that in every measurable way, the world has been getting better for generations -- richer, less violent, more educated, better fed, safer, more accepting of equality for women and gays, and in many ways even more ecologically sustainable -- and that these trends are accelerating. Knowing how pervasive popular beliefs to the contrary are, he backs up every point with evidence, anticipating and answering the obvious objections. He doesn't deny that problems exist, of course, but puts them in perspective -- today's balance of problems and advantages is not only better, but vastly better, than any previous era's balance of problems and advantages. Considerable space is spent addressing the threats which generate the most pervasive worry -- nuclear war, high-tech terrorism, runaway AI, ecological degradation, even overpopulation (I'm often amazed at how many people today still write about population growth as if it were the 1980s and still possible to pretend that people like Paul Ehrlich had some idea what they were talking about). These problems are at least potentially real (well, not runaway AI), but there are things we can do, and have been doing, to mitigate them -- and none of them are grounds for thinking doom is inevitable or even likely. Some types of apocalyptic-scale disaster, such as mega-epidemics, actually happened regularly in the past but are now very improbable. The reason for this progressive trend is the rise of science, reason, and humanism -- the values of the Enlightenment. Ever since they emerged, these values have been under sustained attack from advocates of the older, failed world-views they have been displacing, an attack which continues today and makes the robust defense of Enlightenment values a necessity -- hence the title of the book. Pinker's critics like to accuse him of measuring good by dry facts and figures which don't necessarily reflect the true state of human happiness. But those facts and figures represent real change which has had a massive effect on the human experience of life, like huge declines in infant mortality, or the eradication of smallpox. Imagine the effect on overall human happiness of hundreds of millions of parents who don't suffer the death of a child, or hundreds of millions of people who don't suffer the death or disfigurement which smallpox inflicted on so many for generations before technology defeated it. If you think that the great global advances in literacy, food security, access to clean water, contraception, etc. don't represent real gains in quality of life, try to imagine your own life without those things. Pinker's optimism is decidedly not an argument for complacency. Given that things have been improving so much, it's imperative that we accurately understand why, so we know how to keep things getting better and avoid regressing to humanity's earlier, more natural state of poverty, violence, and ignorance. Since the trends are global, in order to understand why they are happening, we need to examine factors at work in a broad range of countries -- analysis based on events in just a single country or even a single cultural region is parochial and likely to give misleading answers. Very often it turns out that the real reasons for the gains have nothing to do with the claims and prescriptions of any of our popular ideologies. 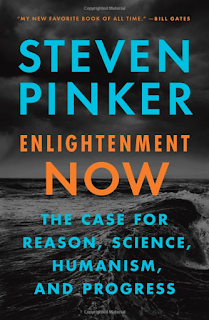 Toward the end, Pinker addresses the two main rivals of Enlightenment values. One is the traditional religious world-view, exemplified by the American Christian Right and by the hard-line Islamism of the Saudi and Iranian regimes, Dâ'ish (ISIL), and similar groups. The other is "romantic heroism: the idea that morality consists in the purity, authenticity, and greatness of an individual or a nation" (p. 419). This includes, but is far broader than, movements such as Trumpism and the fascism of early 20th-century Europe. 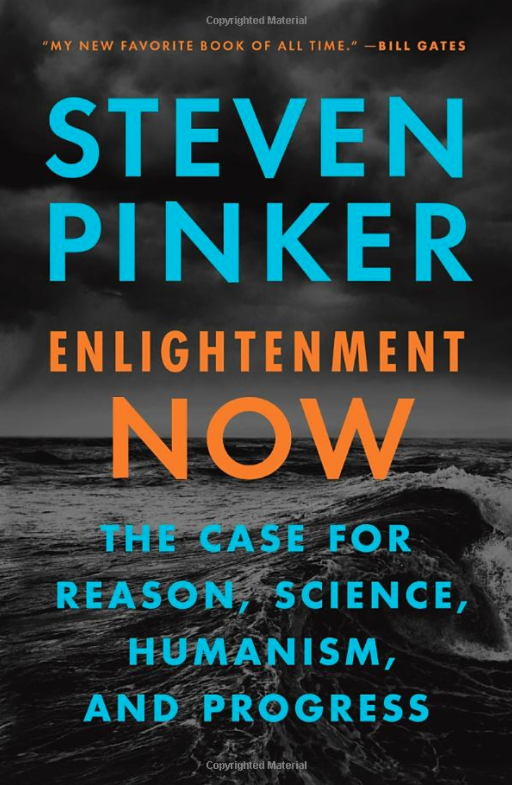 Pinker shows that neither alternative can solve the world's problems or guarantee the continuation of progress the way science, reason, and humanism can -- and he's confident that in the long run neither of them can prevail, even if they manage to inflict setbacks for a few years in a few countries. I disagree with Pinker on a couple of points. He minimizes the problem of economic inequality, but doesn't address the biggest threat it poses, which is excessive concentration of power in the hands of the ultra-wealthy. He favors nuclear energy over solar and wind energy to combat global warming, rightly showing that it is much safer than most people think, but doesn't address the issue of over-centralizing power generation in a few vulnerable reactors as opposed to a distributed network of smaller generators. These are trivial compared to his overall case, though. He finishes with a few much-needed admonitions. "When we fail to acknowledge our hard-won progress, we may come to believe that perfect order and universal prosperity are the natural state of affairs, and that every problem is an outrage that calls for blaming evildoers, wrecking institutions, and empowering a leader who will restore the country to its rightful greatness..... Remember your history: the fact that something is bad today doesn't mean it was better in the past..... Not every problem is a Crisis, Plague, Epidemic, or Existential Threat, and not every change is the End of This, the Death of That, or the Dawn of a Post-Something Era. Don't confuse pessimism with profundity: problems are inevitable, but problems are solvable, and diagnosing every setback as a symptom of a sick society is a cheap grab for gravitas" (p. 452). I first heard about this book here and immediately knew I had to read it. If you want to know the reality of the world which is too often masked by rhetoric and clichés, and don't mind having a few of your preconceived ideas challenged, I urge you to read it too. Never heard of it (many I dont, my reading books is lacking), but it certainly sounds interesting and fun. There is alwayz hope, just a matter of getting action, the way I see it. This lady I know here in Dallas recently asked me "Tom, what is the problem, etc..." she was talking about everything from the explosion of rent prices to politicians, corruption, etc. Anywayz, I told Elaine ... "one of America's biggest problems, is that we have too many people that dont vote" ... I was giving her a hint ... Elaine dont like either party of politics, she WONT vote, yet is unsatisfied with so much. She also asked me once, when I was informing her on some of the scams to milk taxpayers, and the other money milking stuff, and defense spending, etc ... she asked "How can you sleep at night following all that? ... dont it depress you?, etc" I told her ... "NOT in a bit, Elaine, actually, just the opposite, it keeps me aware and sharp, of what's happening and enlightens me, if anything ... No, Elaine ... I actually sleep like a baby. But back to the book review, Thanx, sounds like one that is worth the read. It definitely sounds like this author touches upon a lot of things that need to be talked about or things that people talk about these days. Interesting subject matter. Glad you found it of interest!